I feel this way about the Mets every year. I understand the concerns of Mets fans, I’m a lifelong fan myself, so obviously, I get it. I worked my stomach into knots after the 2015 season praying that the Mets would resign Cespedes, I was heartbroken when the Mets tendered an noncompetitive offer to Daniel Murphy after having a dream season and I’ve hoped, mostly in vain, that the Mets would sign the big free agent in various off-seasons. One of the biggest disappointments I can remember was the 2004 season. At the trade deadline the Mets traded away Scott Kazmir to the Devil Rays for Victor Zambrano and Bartolome Fortunato. In my mind, that year, Kazmir should have been untouchable. He was the top pitching prospect in the Mets farm system and arguably the top pitching prospect in MLB at the time. Neither Zambrano nor Fortunato worked out for the Mets, but Kazmir didn’t go on to the career most Mets fans (including myself) had envisioned for him. He went to the All-Star game twice and had more than 10 wins three times in his career and finished with a 4.01 ERA, which included stints with six different teams. While, this was a bad trade for the Mets, we certainly didn’t lose the windfall that we thought we had back then. This offseason, the Mets traded away 19 year old prospect Jarred Kelenic. I know this stung for a lot of Mets fans, however, the Mets got arguably, the best reliever in baseball in return. Much like Kazmir was, Kalenic is just a prospect. We don’t yet know what we traded away. The Yankees have been one of the top teams mentioned for both the top two free agents this year, Manny Machado and Byrce Harper. They also took over Giancarlo Stanton’s huge contract last season. However, this is who the Yankees are. For decades we have been used to the Yankees opening up their wallets to buy championships. That’s who they are. It’s not who we are. 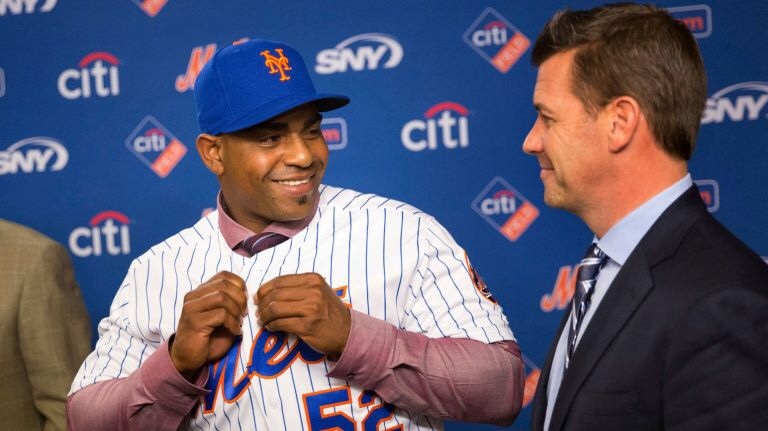 The Mets have had a very busy offseason, an offseason frankly, fans should be excited about. Instead of signing flashy free agents, the Mets front office, led by new General Manager Brodie Van Wagenen, had identified the Mets holes from last season and addressed every single one of them. The Mets have much better depth, particularly in the infield, than they had last season. They added one of the best 2nd basemen in MLB history, Robinson Cano, who brings with him plenty of baggage, for sure, but brings, also, a .310 batting average from last season and the post season experience many of the young Mets players could benefit from. Fellow all-star Jed Lowrie and JD Davis were also signed by the Mets to help shore up the infield. Signing Wilson Ramos, who has earned a quick seal of approval from starting pitcher Noah Syndergaard, is a huge upgrade behind the plate. They also upgraded the Mets worst unit from last year, the bullpen. The Mets brought in Edwin Diaz, and brought back Jeurys Familia to set up for him. They also added a slew of other relievers, which could make the unit one of the most formidable in MLB next season. When it comes to building (or rebuilding) a team, the important thing isn’t grabbing the headlines with large splashy contracts – it’s about putting together the pieces needed to be competitive. While, this team certainly isn’t perfect and there are still some question marks, it’s a much-improved team over last season, and as Mets fans –we have a lot to be excited about.